Finally, a hearing aid that you can simply insert and forget! If you are searching for a discreet hearing aid, then we have just what you need at A&E Audiology & Hearing Aid Center. Our office is the ONLY Lyric provider in Lancaster County! Find out if you are a candidate for Lyric by scheduling your complimentary screening today! Lyric is a very small hearing aid that is placed in the ear canal by our doctor, as opposed to traditional hearing aids, which are worn outside of the ear. 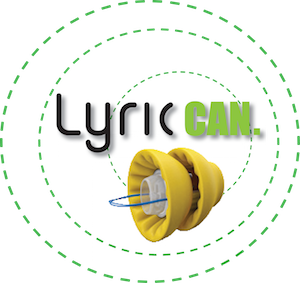 Lyric works with the natural anatomy of your ear to provide a clear hearing experience all while remaining invisible! *Lyric is water resistant, not waterproof, and should not be completely submerged underwater. Not a candidate for Lyric? That’s ok! We also offer many other custom and invisible solutions for our patients, such as custom hearing aids from manufacturers from Oticon, Phonak, and Widex. Invisible hearing aid devices come with wireless options custom-fitted to your exact needs and unique ear canal shape for the best possible hearing experience. Because they rest comfortably deep in your ear, only you will know they are there. Even though your hearing aids are tiny, they come loaded with all of our industry-leading technology. The benefits of our customized hearing aid devices are numerous. Schedule your complimentary screening today and discuss Lyric and other invisible hearing aid options with our doctors! Call our Lancaster, Lititz, or Willow Street hearing center today for a complete hearing screening, and let us show you how discreet today’s hearing technology can truly be. Come experience A&E Audiology & Hearing Aid Center! You will see for yourself that our audiologists provide 5-star-rated hearing aids in Lancaster, Lititz, Willow Street, Rohrerstown, West Township, Millersville, Mountville, Central Manor, Landisville, Silver Springs, Lancaster City, Mt Joy, Marietta, Neffsville, East Petersburg, Manheim, Rothsville, Akron, Ephrata, Brownstown, Leola, New Danville, New Providence, Strasburg, Buck, Quarryville, Conestoga, Rawlinsville, Georgetown and Christiana, PA. We look forward to meeting you!